Publishing News & Signed Paperback Winners! My Facebook Page surpassed 300 followers! Thank you! But I have more exciting news! 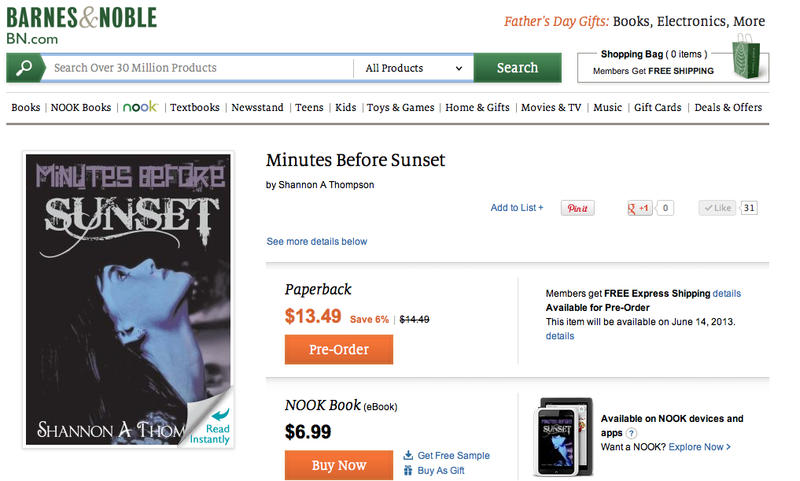 Minutes Before Sunset’s paperback is available as a preorder on Amazon and Barnes & Noble! I’m excited, because both companies have indicated that they will ship the novels on June 14, 2013. If you’re interested in preordering the paperback, click the links: Amazon and Barnes & Noble. Just the finest of points, but a friend and wife of a soldier told me that Memorial Day is for remembering the fallen, and Veterans’ Day is especially for saying thanks. She also said “Anytime we say thanks to a soldier is a good thing.” For what it’s worth…. Thank you :] It’s pretty exciting! Hi Shannon. Wanted to say thank you for following my blog and it’s very commendable that you acknowledge the sacrifices made by men and women you may not even know. Kudos. Of course! You’re welcome. Good to have you on board :] And sacrifice, to me, often leads to happiness, success, and safety. It’s vital, and I value it immensely.